The Bourne Legacy begins with the exact same image its predecessor ended with; a silhouette of a man struggling underwater, but as he emerges the difference is plain to see: this is not Jason Bourne. 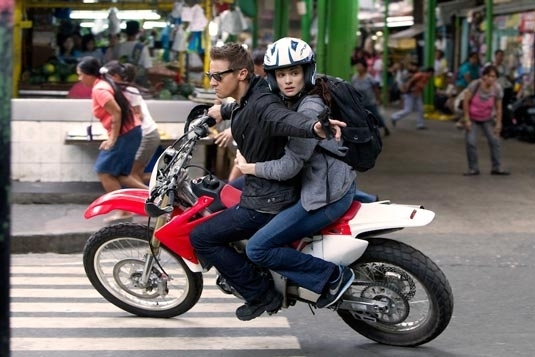 It is this balance of familiarity combined with new found novelty that perpetuates throughout the film and makes The Bourne Legacy something of an uneven affair which struggles to find its own identity under the weight of the franchise bequeathed to it. 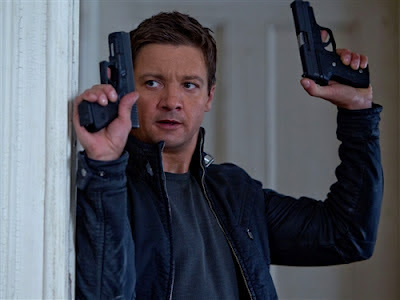 With series’ lead Matt Damon opting out of continuing here, Jeremy Renner steps forward to take up the mantle of central protagonist. Previous director Paul Greengrass did likewise, prompting Universal to go to the closest creative connection in hiring Tony Gilroy, writer of the original trilogy to direct this fourth installment. Picking up after the events of The Bourne Ultimatum with Bourne once again in hiding, CIA operative Eric Byer (Edward Norton) is assigned to wipe the slate clean on the super-soldier project from the original trilogy and eliminate all agents still in the field. 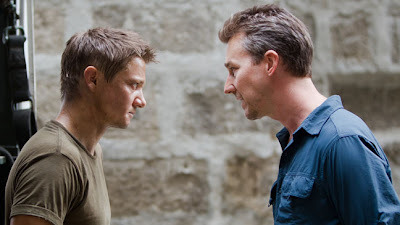 Which of course, happens to include new protagonist Aaron Cross (Renner). Gilroy’s familiarity with the material is apparent throughout, and the techno-thriller style of globe-trotting mixed with dialogue that fires government acronyms left, right and centre gives the plot consistent rhythm, and helps even the more mundane scenes simmer with tension. In the early scenes, references to Bourne and re-used footage from the Ultimatum make his absence feel a little more conspicious until Byer, in a wonderfully matter-of-fact tone that only Norton can deliver, informs his subordinates and the audience “this isn’t about Jason Bourne”. From there the plot ventures forth tentatively, feeling like a child left alone by a weary mother. We do learn more about the super soldier program than we had in previous films, but in doing so much of the intrigue and mystique is robbed. Expanding on it’s origins was to be expected, but the explanation of it being pills that make these men what they are seems a little too clinical and falls a little flat. It’s a perfectly reasonable explanation, but the mystery was sexier. Introducing the medication element to the plot is at least tied in to Cross as a character, though perhaps not ideally so. The conviction Renner brings to tortured characters is partly what makes him so engaging as an actor. His portrayal of Cross as borderline drug addict, prescribed to the aforementioned prescription of performance elevating drugs, however, makes for unsettling viewing that doesn’t completely feel at home with a summer action movie. The steel is taken off Renner’s character in later scenes, but perhaps too late. Not enough time is given for him to really set his feet and show a character early on. The same is partly true of Rachel Weisz’s Dr. Marta Shearing, a rather naive scientist working for the program. Her interactions with Cross form the emotional crux of the story and it is here that the added detail about the program is gleaned, and whilst it’s a proven structure the pairing doesn’t always feel natural. Weisz brings great intensity to the role but isn’t given much motivation beyond being kidnapped by an equally intense Cross. Even as the inevitable Stockholm syndrome sets in the film doesn’t feel like it has given her enough investment in the story. Some of the great interplay between hunter and hunted is also lost in the mix. Norton is effective in his portrayal of agent Byer, but only in small fleeting scenes is there any personal or further motivation planted for his pursuit. The CIA simply chases, and Cross evades, swatting them away like annoying flies. By the end an admission is made by the film itself that there is no clear confrontation in sight so a villain is manufactured and shoehorned into to bring about a satisfying conclusion. Despite the meandering and missteps of the plot, Gilroy’s direction of the action is surprisingly confident throughout for a man with limited experience in the genre. He adopts Greengrass’ faux-documentary style with aplomb, including gratuitous use of frantic camera and cuts that can nauseate and thrill in equal measure. The Bourne Legacy isn’t a bad film. Individual scenes gleam in the rough and provide brilliant tension that channels that quintessential Bourne feel. It’s only when looking larger that the film comes up short. Whereas a Bond film can detach itself from its predecessor(s) and forget, Bourne feels ironically shackled by its legacy, determined to tie up knots that many will feel were perfectly fine remaining undone. It is an exciting and at times interesting film but also manages to ultimately feel somewhat unnecessary and redundant. If the franchise is to continue then hopefully another film can make a fresh start and leave the legacy to memory where it belongs. 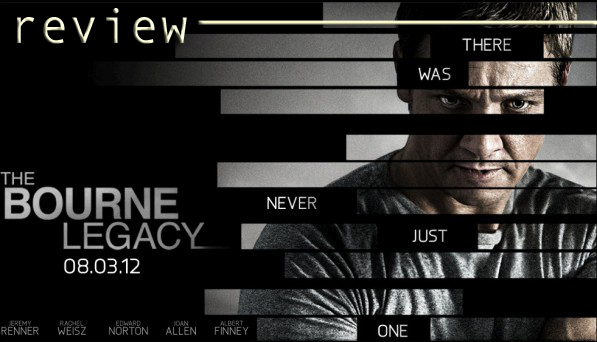 The London Press Screening for The Bourne Legacy was attended by (A)musings Contributor Charmaine Anatole. (A)musings gratefully acknowledges Universal Pictures UK's invitation to attend the press screening for this film. (A)musings Website Coming Soon at www.amusings.co.uk! Cool review, am a big fan of the bourne films so will be checking this one out even if i cant imagine anyone other than matt damon being the lead. Hi Aaron, Glad you liked the review, I've heard rumours of Damon returning for a sequel but I agree the series doesnt quite feel the same without him, and this is coming from a big Jeremy Renner fan.